Enoki mushrooms also known as bean sprouts mushrooms are one of the most popular mushrooms on earth. Because of its unique look and taste, it’s very popular around the globe. These Mushrooms are also very healthy. 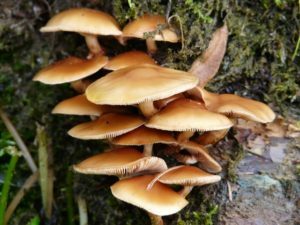 There are lots of different places where this mushrooms can be found, but they are mostly found in Japan. These mushrooms are most popular in Asia. They are also very healthy and have a unique taste. They are often used in soups and on salads. They are often used in many high-class restaurants for different recipes. So knowing how to grow these mushrooms can be very useful especially if you’re planning on cooking or selling them. Here are a few easy steps to grow enoki mushrooms. Preparing a growing medium is the first step of these process. Without the right medium, you can’t grow this mushroom. Enoki mushrooms require a low temperature. So you should prepare a cold house in case you live in a hotter area or you need to use a room with temperature control. You need to choose a PP, PE bag which is 40 to 20 cm in size. And 0.05 – .06 mm thick. You can also use bottles to grow enoki mushrooms. You will need papers or cloths to cover the bottle before sterilizing or boiling it. Using a cold storage isa also a good idea. Most enoki mushroom farms use storage. It’s best to use bottles because they are cheap and easy to get. You can find plenty of abandoned, unused bottles near junk yards and other places like that. You can also use jars, but you have to cover it with paper or cloths before you sterilize it as well. These mushrooms don’t take a lot of space that’s why a bottle can be used. And that’s one of the reasons why it’s easy to grow in small spaces. After that you have to mix the materials which will be discussed next. Mixing materials for enoki mushrooms are quite tough. But if done right it can have great fruit. There are plenty of things that go into mixing. Like peanut shells, sawdust, hardwood sawdust, Bodhi tree sawdust, Bagasse or banana peel, etc. finding these items are relatively easy. You can buy some of them, but most can be found around woods or other similar places. They don’t cost much to gather. And often easily found. You can use a machine to mix or your hand. Either option is fine. You can also use rotten fruits or other rotten fruit materials that can be found near grocery stores. It’s much easier if you have a garden or live near a garden. You can also use corn cobs. They are easy to get; most farmers have them lying around. They might even give them for free. Another material is mung bean stems.It’s also very useful and easy to mix. You should also consider saving some materials as they may be used later. You also need to know how to mix these materials as without that it’s useless to gather materials. And that will be discussed next. So read the next step carefully because it’s very important on how to mix them. Sawdust is only used for enoki when composted in a pile after 3 – 6 months. If in a hurry you can expose them to the sun and mix with water after a few days. Before growing the mushrooms and putting those in the bottles (if you’re using them need to be sterilized. First, you need to select the bottle or jar. It has to be big enough for the mushrooms. Then put it in a bowl of water or a dish full of water. Make sure the glasses are thick and don’t crack at extreme heat. After that boil the water with the bottle. It will sterilize the bottle from any other pathogen or microbes. It is also important to make sure the glass isn’t broken. Now after this you need to make sure growth happens properly which will be discussed next. First, you have to use Steam to kill pathogens discontinuously like the other mushrooms. Wait until the cold is at 250C and give it to seed growth chamber. One bottle of seeds can be used to plant for 30-40 bags. You need to use the bottles or bags of seeds whose white mycelium grows to the bottom instead of the other ones which are stored longer than two months. After planting the seeds to the bags put those bags on the 1 meter wide wooden or bamboo shelf. Its length depends on the area of the room, and each layer of the shelf is separated from 50 to 60cm. Maintain the temperature ranging between 20 and 230 The mycelium will grow full of the bags after 20 – 30 days. The relative humidity in the mushroom growing rooms should be maintained about 80-90%. When the fruiting body are formed, the most suitable temperature is 130o Enoki mushrooms should not be grown at the temperature of over 160C. When the fruiting bodies grow, you need open the bags, keep the relative humidity about 80-85%, and maintain the diffused light. Extending the top side of bags should comply with the rules that the bags are always 5 cm higher than fruiting bodies. Otherwise, the fruiting bodies will grow early and mushroom stews are short. When enoki mushroom stems gradually grow high, you should lower the relative humidity down to 75-80%, keep mushroom growing rooms dark from the fruiting bodies appear until harvesting. After all the hard work perhaps the sweetest step is harvesting the mushroom. First, you have to make sure that they are 15cm long. This is the first phase of the harvest. After collecting pull the bags up to 2 cm. Keep the temperature to 18 degree Celsius. After 3 – 4 days the fruiting bodies will appear again in the second phase. The whole process will end after 75 – 90 days. Another method is growing enoki mushroom from both sides. You have to add the materials to the tube and on the two sides make cotton buttons. Then put them on the shelves.